Feast Bar & Kitchen has become the latest restaurant to open at White City Place. Managed by the company behind Pergola on the Roof, the 5,000 sq ft drinking and dining destination will play host to a rotating line-up of London’s most innovative independent eateries. Open six days a week, Feast is set to become a West London haven with its contemporary interior of lush greenery, granite and timber. The hybrid bar and restaurant space features big sharing tables and communal seating for 300 diners, with an extra 157 seats outdoors for alfresco summer dining and DJs for entertainment. Taking the first six-month residencies are Mexican taco brand Del 74 and Hackney comfort-food experts Morty & Bob. The street-food inspired eateries offer bespoke all-day menus with a choice of Mexican sandwiches and tacos or grilled cheese sandwiches and salads. 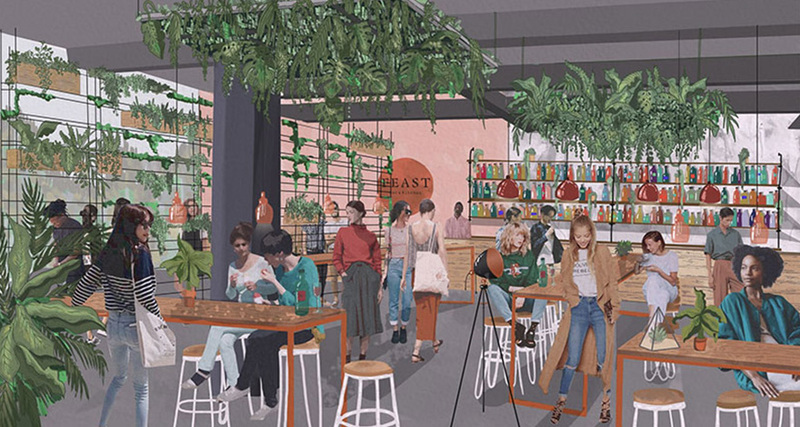 Feast Bar & Kitchen follows on from the successful Pergola on the Roof, which saw over 200,000 guests eat, drink and party at Television Centre over two years. The concept has now been rolled out to two other London venues in Paddington and Earls Court.